Are you looking for somewhere to bring your group for a fun, folk-filled break? 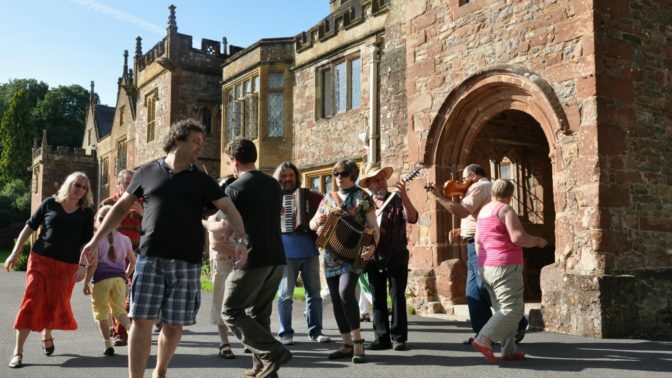 Since 1965, Halsway Manor has welcomed countless folk clubs, dance groups and societies from all over the UK to run their own residential folk events. If you are looking for a venue to stage your own residential course, training event, conference, holiday break or private party – give us a call. With a warm and friendly atmosphere and a fascinating history that goes back six-hundred years, Halsway Manor is the perfect getaway. We pride ourselves in looking after our guests, offering full-catering, comfortable bedrooms (serviced on request), and staff who are always on hand to support group leaders, tutors and guests, and to make everyone feel at home. In short, it’s the perfect venue for your residential event. Set in 6 acres of beautiful grounds with direct footpath access to the Quantock Hills (England’s first designated Area of Outstanding Natural Beauty), our facilities include a Ballroom, Great Hall, folk library, bar/lounge, 27 bedrooms (single, double and family rooms, 19 have ensuite bathroom facilities, 2 are accessible), plus camping, space for caravans and camper vans and lots of free parking. All our food is freshly cooked using local ingredients by our full-time chefs. We can provide whatever you want from welcome tea/coffee on arrival, formal served three course meals, more informal buffet style meals, family friendly menus, great breakfasts, packed lunches for trips out, outdoor barbeques and a proper job west country cream tea. We pride ourselves on meeting everyone’s dietary needs and putting together menus and timings to suit you. Halsway Manor is a stone’s throw away from many places of interest, including Dunster Castle, NT Selworthy Village, the West Somerset Steam Railway, Hestercombe Gardens, Coleridge Cottage. Exmoor is on our doorstep and the coast is just minutes away. It is also close to many places of interest to folk enthusiasts – including Watchet where Cecil Sharp collected many sea shanties, the ruins of the cottage where folklorist Ruth Tongue lived and the village where William Winter wrote down many fiddle tunes in the early 19th century. History is all around you with prehistoric sites on the Quantocks to fossil remains on the beach near Kilve. There is plenty to do all year round. Large groups (30+, but sleeps up to 65) can book the Manor in it’s entirety, but there’s also the option for smaller groups of 10-16 to join us, and share the Manor with another course. To discuss availability please contact Viv Butler, Bookings & Events Manager. office@halswaymanor.org.uk / 01984 618274 ext 1.